From the research she was able to carry out locally and online, Kate Bevan paints a fascinating story of her home, the first inhabitants, and the beginnings of Swindon. In my last post I wrote about discovering who used to live in my house in Swindon in the first years after it was built, c1877. I was particularly interested in the Cannon family, who had moved into the house around 1890. Joseph, his wife Louisa, and their six children. By looking at the Census records I found that Joseph and his sons were all employed by the Great Western Railway. I even found Joseph’s son (also called Joseph) in the railway apprenticeship records available on http://www.ancestry.co.uk, showing him registering as an apprentice boilermaker on his 14th birthday. I knew that the railway had had a huge impact on the town, with the population increasing dramatically since the opening of the railway works in the mid 19th century, and I wanted to find out how typical the Cannon family were of others in Radnor Street. I began by looking more closely at the 1891 Census returns for the street. Of the 67 houses that were built by that point, all of which were no more than 3 bedrooms, 31 had more than six people listed as living there, while some had as many as 12 people. The street must have been a lot more crowded in those days than it is today! In 1891 there were 123 men and boys of working age living in the street, and of these 58 were working at the railway works. The remaining occupations shown in the Census were mainly related to building trades. This gave me a good insight into Swindon’s dependence by this time on the railway works to provide work, and on the continuing need for new housing to accommodate the workers. 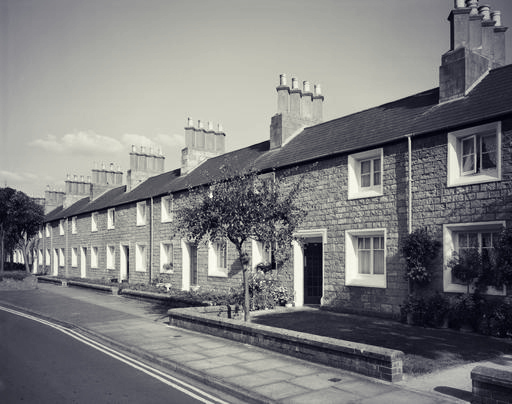 The Census also showed me that most of the adults living on Radnor Street in 1891 had not been born in Swindon, but had come from many different areas of the country, including Scotland, Wales, Lancashire, Yorkshire, London and Cornwall. Clearly Swindon was still very much a ‘new’ town. I had discovered that the Cannon family probably were fairly typical of many of the families on Radnor Street in the 1890s. I could imagine the men and older boys going off to work in the mornings at the railway works only ten minutes walk away, the children going off to the local board school and the women doing the housework, washing and cooking. The sense of community would probably have been a lot stronger in those days, with everyone knowing their neighbours and many working in the same place. I decided to read a little more generally about Swindon at this time, to try and find out more about the kind of life that the people of the town had, and what wider impact the railway works had had on the local area. I visited the local studies section of Swindon Library, where I found a lot of interesting information. I read that the houses known as the ‘Railway Village’ were the first to be built for the workers, and are still standing today much as they were when first built. I discovered that the railway had led to the creation of the Swindon Mechanics’ Institute, which provided a lending library, lecture hall and reading rooms, as well as public baths for the railway workers. Later, a separate public swimming baths and health centre was set up; this building is still in use. 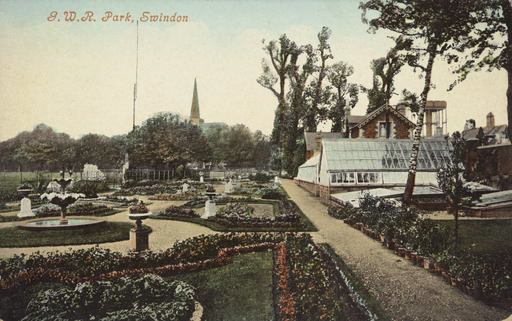 The GWR also provided a park for the railway workers and their families, which was used for relaxation, sporting events, and fetes. The park, too, still exists. I was also interested to find out about the annual railway workers summer trip, when employees of the railway works and their families would board the train for a week’s holiday by the sea. The town must have been deserted for those few days! I began my research – and this blog – as a way of finding out a little more about my house, a house which I considered to be one of many thousand near-identical Victorian terraced workers houses, with little story to tell. The discoveries I have made, though, have really brought the history of the house, the street and the town to life for me. I have found out a great deal about the development of Swindon, how people lived, and the impact of the railway works, which can still be seen in the architecture of many buildings in the town centre. This is the last installment of the Your Home’s History series and we would love to hear in the comments if any of our readers have been inspired to find out more about their home’s past. Hi I trying to find the history of this address. 88 Selsdon Park road CR2 8JT. Like to know if it was a public house in the past ? I found your blog most interesting and helpful. We’ve just moved into a small (two bedrooms) victorian semi detached house in Clevedon Somerset and are very keen to find out its history. There were mining rights to the back cliff which is now our terraced garden so we are not sure where to start first! Previous post How do you protect a historic garden?